Key Difference: Business Class offers a higher level of service than the economy class. There are fewer seats put together, two instead of three. The seats are more comfortable and have a higher degree of angle (approximately 170 degrees). 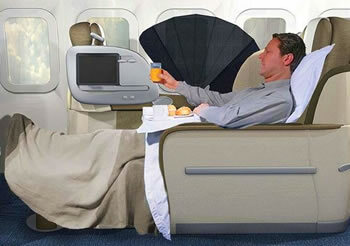 First Class is considered as the most luxurious class of travelling. First class is roomier and has large comfortable reclining seats that can convert into flat lie beds. The long journey from one end of the globe to the other can sometimes be long and tedious, especially when it is accompanied by uncomfortable seats, crying children, worried first-time fliers, etc. These factors can really hinder the flying experience, resulting in many airline companies introducing different classes: Economy, Business Class and First Class. The Economy Class is easiest to understand as it is the cheapest class available. First Class and Business Class can be confusing as they both offer similar services. Before flying any class, it is pertinent to understand the differences between the different classes. Business Class was introduced as an alternative to the Economy Class in the late 1970s and as an intermediate between the Economy and the First Class. As the name suggests, Business Class was initially for the businessmen that would require more comfort during travelling for meetings. Business Class offers a higher level of service than economy class. There are fewer seats put together, two instead of three. The seats are more comfortable and have a higher degree of angle (approximately 170 degrees), allowing it lie flatter for a more comfortable sleep. Some airline companies also allow fully flat seats that can turn into a semi-bed. The Business Class also offers a wide range of food options, along with choice of champagne, water or free alcohol. The in-flight food is usually 3-5 courses, along with different choices available for wine, beers and liqueurs. Business Class passengers are also allowed to board on and off the plane before the Economy Class. Certain airline companies may also offer other services such as chauffeur services, help with immigrations and baggage. First Class is an elite Class that is even higher than the Business Class. It is considered as the most luxurious class of travelling. 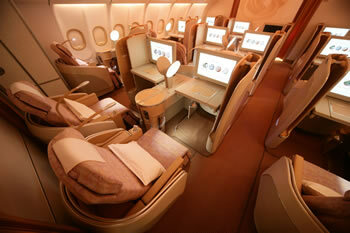 Most flights have very few First Class, approximately twenty seats, which are located in the front of the flight. First class is roomier and has large comfortable reclining seats that can convert into flat lie beds. It comes with workstation and TV surrounded by privacy dividers. Each cabin is divided with a divider that can be raised or dropped depending on the requirement of the passenger. The bathrooms are bigger and some flights also offer shower options. The toiletries offered are branded. The airlines offer a wide 3-5 course meal with many options including caviar and expensive champagne. The class also offers a full mini bar. Alcoholic and non-alcoholic are complimentary and the gourmet meals are served with a choice of dessert, wine and aperitifs. The food is offered on white linen table cloths and with real cutlery. Many airline companies offer First Class passengers with a dedicated lounge for waiting before boarding and also chauffeured limousine services. This class is the most expensive class for travelling. Business Class is cheaper as compared to First Class, but more expensive than Economy. Many airlines have dropped First Class altogether and have instead stuck with Business Class as the higher class. Business class is a good upgrade on flier miles; however, many believe that the First Class is not worth spending the money, specifically for shorter flights. The level of standards offered differs depending on the airline companies. 3-5 course meal, different choices of alcohol, dedicated security lane, chauffeur services, etc. 3-5 course gourmet meal, real linen table cloth and cutleries, branded toiletries, shower options, linens, pillows, pajamas, chauffeured limousine services etc. One hostess assigned to only two to three passengers. The hostess is trained to cater to almost all needs of the flyer, including understanding which wine goes best with which cuisine.